In the context of, and above all inspired by the Arts Festival “EUROPALIA Indonesia” which is held at BOZAR in Brussels, the volunteers of the Ethnographic Collection wanted to bring the Indonesian atmosphere to Ghent as well! 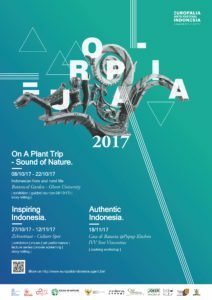 This Ghentian counterpart of the Festival brings together Indonesian history and culture in the form of two consecutive exhibitions, complemented by a lecture series. The exhibition “Inspiring Indonesia”, which is held at the Zebrastraat Cultural Center, opens a dialogue between the exotic Indonesian culture, embedded in traditional artefacts belonging to the Ethnographic Collection of the Ghent University Museums on the one hand, and contemporary work by artists who are inspired by this foreign culture on the other. In addition to the two exhibitions, there will be 4 lectures by experts who will speak about their field of study, always in relation to the Indonesian context. The Indonesian cooks at Casa di Batavia organise a cooking workshop and take you to the world of boemboes. These are finely ground herbal mixtures used in Indonesian cuisine. Traditionally, the ingredients are thrown into a mortar and crushed. The cooks lead you into a rich world of typical and rare herbs. Accompanied by them, you will learn to make a real nasi goreng dish with oedang goreng (baked scampi) and a customized garnishment.